To stand on a Himalayan summit with a sense of great achievement, Mera peak climbing trip offer best opportunity to trekkers and climbers alike who have been seeking the thrill of adventure beyond hiking in Nepal Himalayas. We stay on the full supported tented camping away from the teahouse crowd. 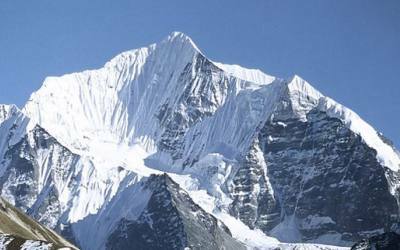 It is not mandatory that you have prior climbing experience, as this is a non- technical trekking peak climbing in Nepal. 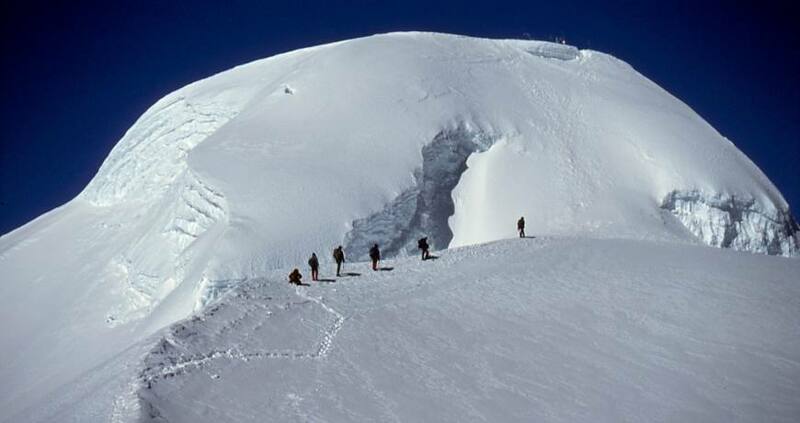 In case of heavy snowfall or a maze of crevasses our experienced climbing Sherpas and leader will assist you. 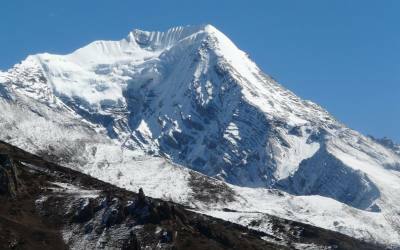 Day03::Kathmandu – Phaplu by air then by Trek to Ringmu: (2500m) . From Nhuntala the descent continues to the Dudh Kosi (‘ Milk River ’) and cross this river using a 109m long suspension bridge (1510m). Our trek then climbs out of the river valley through fields of barley, wheat and corn to the sprawling Rai village of Jubing (1680m). We continue to climb up a ridge to a Sherpa village named Khari Khola (2010m) over night in tea house. The trail goes up from the Chhatra Khola and we reach to kute, passing forest on the way. As we trek beneath the Mera Himal along the ridge of the Hinku Khola, you will experience the day very short. We reach at Tamgnang which is a grazing area in summer. You begin to see simple lodges and shops from this point. We stay over night at Tanganag. After having breakfast in the morning, we prepare ourselves for the ice climbing. And this ice climbing is just above the Khare. We have to walk couples of hour from this point and you will come to see beautiful views of Mera La on the trail. We spend few hours practicing ice climbing here. Our team leader will instruct you about climbing. We stroll back to campsite after few hours practice. We pack our mountain bags and equipments here for the final preparation. We stay overnight at Khare. Over night in guest house. This trek is relatively short and it offers enough time for acclimatization. This acclimatization gives us energy to Mera base camp. When we reach the Mera La pass, we will come to notice spectacular view and them we come down and continue to walk towards the Hongu side. We set up our base camp in the moraine, below the ice. We spent the whole night at Mera base camp. We stay overnight at Tent. 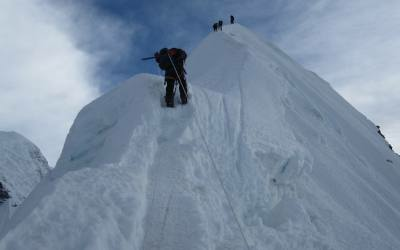 Climbing Mera high camp could be risky if you witness the fresh snow for there are many crevasses. Then, you come near to the top of the rock band and it is marked by the large cairn. We set up our high camp there from where you can observe outstanding views of the world famous peaks such as Everest, Makalu, Cho Oyu . We stay overnight at Mera high camp. Today the trail starts early in the morning for this is a summit day. We walk around 100m and go up with rope and ice climbing to arrive at the summit. You will see magnificent views of Everest (8,848mCho-Oyu (8,201m) Lhotse (8,516m), Makalu (8,463m), Kangchenjunga (8,586m), Nuptse (7,855m) Chamlang (7,319m)m from the summit. Then we go back over to Mera base camp. If we had a rest day yesterday, we could have continued our trek to stay one more night in Lukla. You can get beers at very cheap price there. Over night in guest house. The new route is completed at Khote and it stays on the open hill side which lies west of the Hinku River . The wind blows down the forest. This makes your journey quicker and it offers fantastic views back of Mera peak. Then we come across a Chetera, a small pasture. Over night in guest house. The trail goes over a series of rises and high plateaux before we finally reach the craggy Zatrawa La (4,580m), where we look back on the Hinku wilderness for the last time and the south face of the peak we have just climbed. A gradual descent traverses toward the rocky outcrop of the Zatr Og. Switching over to the north behind this we descend now steeply from the Kalo Himal, the ‘black mountains’, into the rocky slopes and cascading streams of the Sherpa populated Dudh Kosi valley. The high crags give way to forest, where we have lunch in a clearing, then to farmland as we approach the tourist bustle of Lukla (2,850m), our night stop, still high above the river. The village of our outward trek now feels like a metropolis, and a wild party is inevitable. Over night in guest house. Bhaktapur Durbar Square. Bhaktapur is one of the oldest cities in Kathmandu valley. It is well known as Living Museum. Old brick paved enclave of old Royal palace, Nyathapola Temple, Datatriya temple, exquisite artwork offers a picture of the grandeur of medieval Nepal. And Patan is located 7 km away from Kathmandu, this city has many 15th to 17th century, Hindu and Buddhist, monuments built during the Malla dynasty. The most important area with many monuments is the Patan Durbar Square. We stay overnight at Hotel. When there are Single person for this trip then it will cost US$ 2975.00 per person. Additional night in kathmandu will cost US$ 40.00 for Double room with Bed and Breakfast and US$ 30.00 for single room. Trekking and climbing prices with out hotel in kathmandu will cost US$ 2350.00 per person. Note: If some one who is willing to book their trekking tour as a private then the tour will departure everyday. One experience Climbing and Trekking guide (trained by Ministry of tourism), one trekking porter for 18 days and 1 extra trekking porter for 4 days while climbing Mera peak and their meals/ accommodation/salary/insurance/equipments are included in price. Nepal entry visa fee US$ 40 (duration 30 days from date of issue)- Available at 4)Royal Nepalese Embassies and Royal Nepalese Consulates abroad or on arrival at Tribhuvan International Airport in Kathmandu. Tipping for trekking guide and trekking porter.